A sheltered site in full sun. In colder areas grow against a north-facing wall with a frame that makes it possible to install a plastic cover in winter. Figs grown as pillars or espaliered plants can be planted closer - 18in (45cm) apart, and gradually thinned to the best specimens. Topdress the root zone with a balanced organic fertiliser each spring, and mulch with well-rotted organic matter year round. 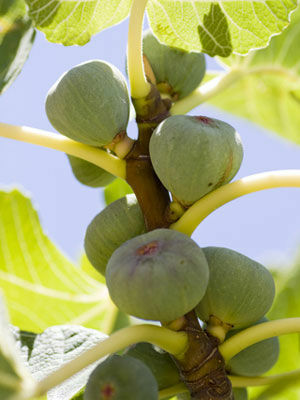 When growing figs in containers, apply liquid tomato feed every 2-3 weeks once fruits appear. Set out plants in winter when dormant. Where winters are cold, try growing figs in containers that are brought into an cool place in winter. May suffer from red spider mites when grown under cover. Can be controlled using soft soap or by increasing humidity. Net figs to protect from birds. Even with netting, ants sometimes invade the open centers of figs.